How Long Are the Lines at Harry Potter in Universal? The LanceAround Family was delighted to have a visit from LizTheFair and JediBFA this weekend. 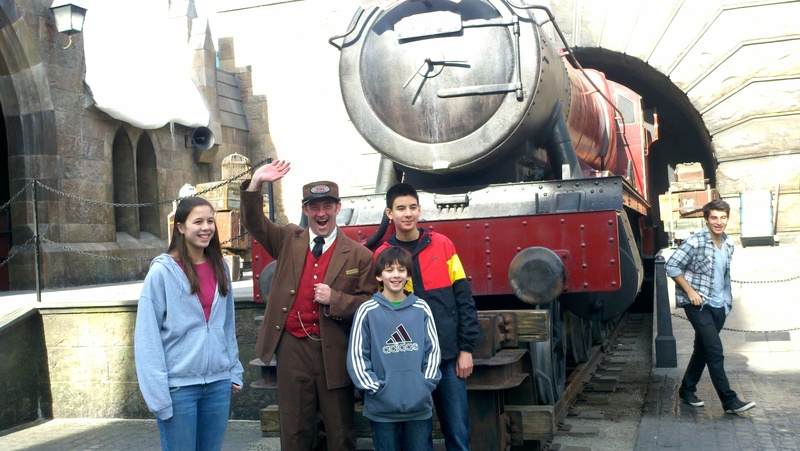 We took them to Universal’s Islands of Adventure theme park so we could check out the new Harry Potter attraction. 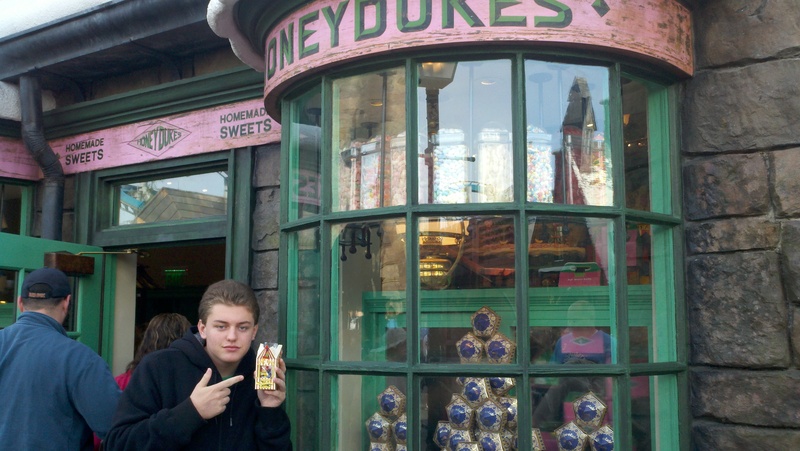 We had heard that it gets crowded at Harry Potter. So we awakened the three LanceAround children very early, picked up Number One Boyfriend and arrived at the gate for Islands of Adventure exactly one minute before the scheduled 9am opening. We discovered they actually let guests into the park 15 minutes before opening. We immediately rushed to the Harry Potter land with nary a glance at the whimsically designed Seuss Landing nor the mythically inspired Lost Continent lands. 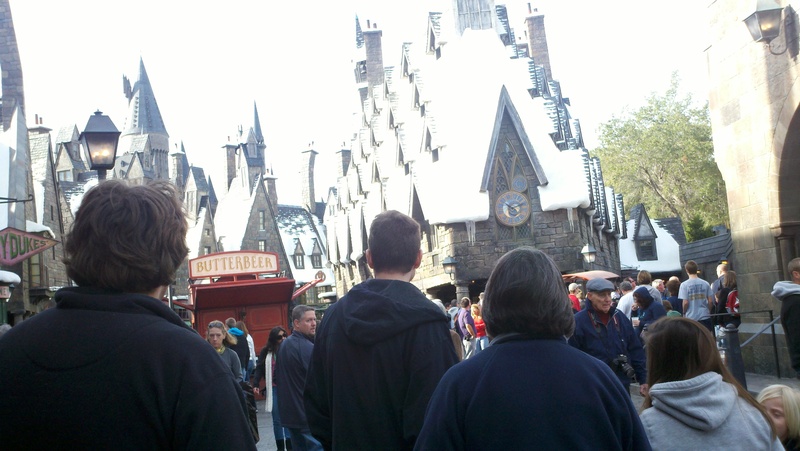 Arriving at The Wizarding World of Harry Potter, we paused momentarily. This was inspired. The crooked chimneys on the snow lined rooftops of Hogsmeade Village combined with the dusty atmosphere of ancient shoppes created the perfect Harry Potter moment. Mrs. LanceAround sighed with content. It felt like we walked right into a Harry Potter novel. As for the lines, despite the fact that we arrived at the park BEFORE the opening hour and IMMEDIATELY walked DIRECTLY to Harry Potter, there were still many people ahead of us in line. The queue moved quickly with a wait time of only 15 minutes or so. However, as we walked to the ride we noticed that the line outside Ollivanders Wand Shoppe was already significantly long. By the time we had exited the Harry Potter ride, Ollivanders’ line had doubled in size. We wanted to go into The Owlery, but were stopped by an employee who told us the entrance was on the other side. We walked to the other side only to discover another line all the way down a long wall and around the corner! We skipped The Owlery. After leaving Harry Potter, we went to Jurassic Park, Toon Landing, Seuss Landing then over to Universal Studios where we rode the Rip Ride Rocket, Twister, Revenge of the Mummy, Disaster, Jaws and Men in Black. Except for Harry Potter, everywhere else was relatively sparse and the wait times were minimal as evidenced by the above videos. 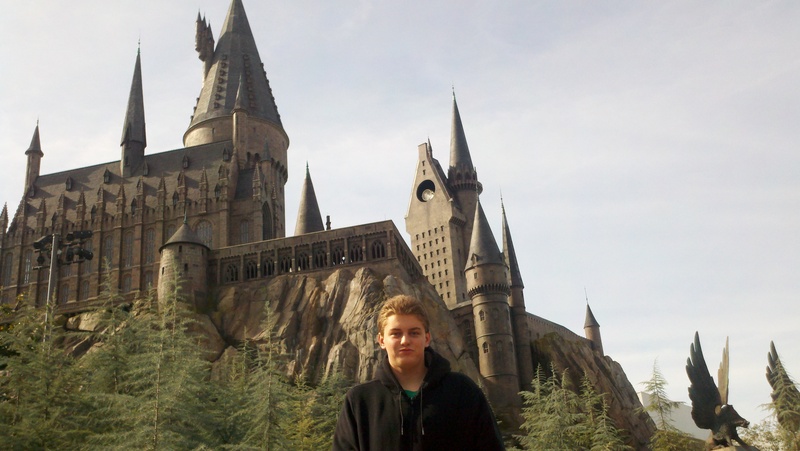 If you are going to Harry Potter–and I highly recommend that you do–be sure to get to the park a minimum of one half hour before it opens and run right to Harry Potter with blinders on your eyes. Experience The Forbidden Journey, Ollivanders and The Owlery as much as possible, then stop for a butter beer or pumpkin juice at The Three Broomsticks. Relax for a moment, and then enjoy the rest of your day in Islands of Adventure. One last tip: As you walk over the bridge from Harry Potter towards Jurassic Park there’s the perfect photo opportunity with Hogwarts Castle in the background! This entry was posted on January 12, 2011 at 2:15 pm and is filed under Universal. You can follow any responses to this entry through the RSS 2.0 feed. You can leave a response, or trackback from your own site.